It was very sad to hear the recent news about the passing of Ron Hunt, centre-half stalwart of the QPR FC League Cup winning side of 1967. Ron was a product of the highly successful QPR FC youth team policy of the mid-60s. During the period 1964 to 1973 he played 255 first team games for the R’s, scoring one goal. QPR FC was his only pro-league club. Although not very tall by modern day centre-half standards, Ron was tenacious in the tackle and this coupled together with his ’thou shall not pass’ attitude, made him a formidable stopper indeed. His assist in the winning goal in that famous Wembley victory against West Brom has been well documented. Ron’s determination to chase the ball down caused a clash with the Albion goalkeeper and the resulting loose ball was hit home by winger Mark Lazarus. Afterwards there was a certain amount of debate in some quarters as to whether this was a foul or not on the keeper? All I will say is that in the 1958 FA Cup final (Bolton v Manchester United) a few years earlier there was an assault by the Bolton centre-forward Nat Lofthouse on the United keeper, which was easily twice as fierce and his goal stood. Different era back then folks! Ron’s career was once hindered by a very long-term injury during the 1967/68 season, but although for many months the situation looked bleak, he did recover to subsequently fight his way back into first team contention. Rest in Peace Ron. You gave your all out on the pitch and were always a good servant to Queen’s Park Rangers Football Club. Ron was born in Paddington on 19th December 1945. He was involved at West Ham as a member of the ground staff and after moving to Slough, he joined Reading. Dave Dorman of the Slough nursery team, the Pathfinders Club, recommended him to the Rangers and he joined as an apprentice in March 1963. After making nine appearances for the reserves, Ron had to spend time in St. Charles’ Hospital. Then it was reported in September that Ron was expected to have a cartilage operation after picking up another injury in pre-season against the British Olympic X1 and would be his second one in a year! He eventually made his long awaited first team debut nine days after his 19th birthday against Bristol Rovers at Loftus Road on 28th December 1964. Ron went on to make 255 first team appearances (including six as sub). 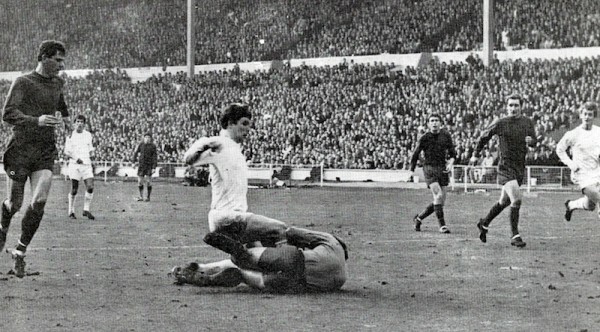 He scored his one and only goal on 14th November 1970 in the 1-1 draw at Sheffield United. Injury forced Ron to retire in July 1973 and his Testimonial game took place at Loftus Road on 3rd May 1974 against Crystal Palace. He then went on to coach at the North Kensington Squash Club. Ron was suffering from bowel cancer and sadly passed away on 23rd August. I can remember his midfield contributions well and his no nonsense attitude which was typified by ‘that goal’ that unfolded in front of us in that memorable season. It was 50/50 and although now you only have to look at a goalkeeper for him to have a free-kick it was a mans game in the 60’s and within the spirit of the game. A sad loss and another brick falls out of the wall that was one of our greatest teams. Very sad to hear of Ron Hunt’s passing. As a lifetime supporter of QPR from my days at Ellerslie Road School next door to the ground from the age of 4 to the present day living in Devon, I remember well how he represented the epitome of a professional footballer in the sixties and early seventies – dedicated, loyal, modest and a talented player. I was fortunate to see him play many times. A sad loss. Glad I was around to have seen Ron Play.